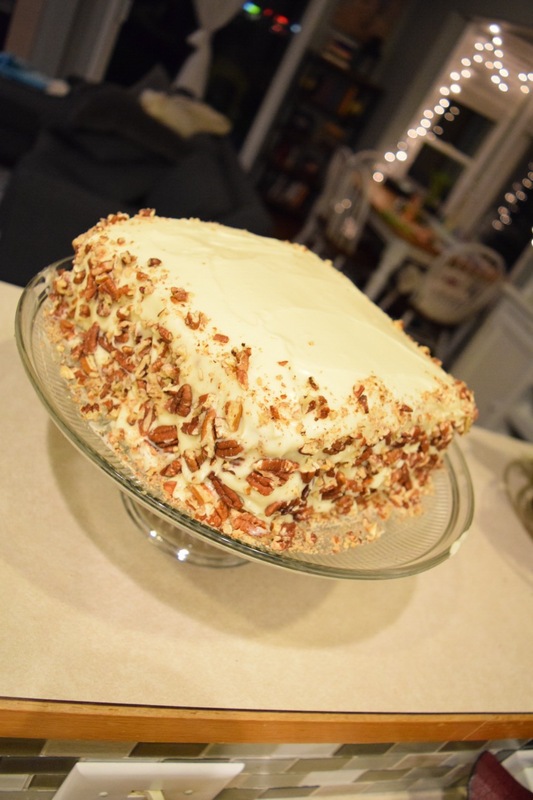 My Favorite Carrot Cake Recipe – Abbey Co. This recipe is brought to you by Sally’s Baking Addiction, one of my favorite baking blogs! Link to original recipe can be found here: My Favorite Carrot Cake, Sally’s Baking Addiction. All pictures used in this post are my own. So, let me get back on track with sharing a recipe that can’t miss… this Carrot Cake recipe! This recipe comes from Sally’s Baking Addiction, a food blog that I follow and love. Any baked good from her blog I trust wholeheartedly, and this one is spot-on, as expected! I often change little things here and there as I go, but I feel this recipe is dialed in just right and I would not make a single edit! It is super moist, deliciously spicy, and pairs perfect with the cream cheese frosting. Don’t be overwhelmed by the number of ingredients you see below, it actually is a quite simple recipe to follow! Just the normal wet in one bow, dry in the other kind of thing. The only advice I would give you: STICK WITH THE PECANS! I was tempted to switch them out for coconut or walnuts. No. Don’t do it. Don’t even think about it. The pecans are what makes this recipe. Contrasted by the sweet and creamy cream cheese frosting, it gives this cake a butter pecan kind of flavor, in addition to all the carrot spice. YUM! Preheat the oven to 300 Degrees Fahrenheit. Line a baking sheet with wax paper. Spread your chopped pecans and bake for 8 minutes. Remove from oven and set aside to cool. Raise oven temp to 350 Degrees Fahrenheit. Butter two 9-inch cake pans and set aside. In a large bowl, whisk the brown sugar, granulated sugar, oil, eggs, applesauce, and vanilla together until combined and no brown sugar lumps remain. Set aside. In another large bowl, whisk the flour, baking powder, baking soda, salt, cinnamon, ginger, nutmeg, and cloves together until combined. Pour the wet ingredients into the dry ingredients and, using a rubber spatula or wooden spoon, fold the ingredients together until just combined. Then, fold in the carrots and 1 cup of the toasted pecans. The rest of the pecans are used in step 6. Pour/spoon the batter evenly into the two cake pans. Bake for 30-35 minutes or until a toothpick inserted into the centers comes out clean. Allow the cakes to cool completely in the pans set on a wire rack. Make the frosting: In a large bowl using a handheld or stand mixer fitted with a whisk or paddle attachment, beat the cream cheese and butter together on medium speed until smooth, about 2 minutes. Add the confectioners’ sugar and 2 Tablespoons of cream. Beat for 2 minutes. Add the vanilla and 1 more Tablespoon cream if needed to thin out. Beat on high for 2 full minutes. Taste the frosting and add a pinch of salt if it is too sweet. Assemble and frost: First, using a serrated knife, layer off the tops of the cakes to create a flat surface. Place 1 cake layer on your cake stand or serving plate. Evenly cover the top with frosting. Top with 2nd layer and spread remaining frosting all over the top and sides. Decorate the sides of the cake with the remaining toasted pecans. Slice and serve! Try this recipe as cupcakes! You’ll get around 2 dozen cupcakes. 18 minutes bake time at 350 Degrees Fahrenheit. I love carrot cake and this recipe looks delicious The pic of the cake made me want a piece right now. Oh my. Yes please! This cake looks just too good. Thank you! It really is! I have had it for breakfast with coffee every day this week… yikes! ah i love cake! carrot cake ❤ the recipe looks delish. i can't wait to try it out! I dont even like sweets and I can’t get enough of it! SO GOOD. I will check out your post too, thanks for reading! Thank you, I seriously cant get enough of it! Thank you so much! It was delicious… and still is actually. I have been having some with my morning coffee every day and I need to stop lol. I know the feeling… it’s too tempting! Very Nice! Looks delicious, I am glad I got to see it! Are you doing any of her monthly challenges? The February one with the chocolate lava cake was yummy! If you do want to take a look at it, it’s on her blog under categories as Sally’s baking challenge- lots of fun! This looks/sounds amazing! I’m going to try this for my next bake, I’ll let you know how it turns out! So going to make this! Yay! That cake looks absolutely delish! Thanks for the post carrot cake is one of my favorites. Thank you! If you are a baker you should try this recipe for sure, it is lovely! ah i love carrot cake. it looks delicious! This looks delicious! Have you ever tried a whipped cream cheese frosting with this cake? I personally like even better than the regular cream cheese frosting. I have honestly not heard of it. What is the difference, just using whipped cream cheese instead of dense? You make the whip cream like normal but do not add the sugar. Then you cream the cream cheese and sugar and fold the whip cream in the mixture. Interesting I will have to look it up and give it a try! I love carrot cake! This one looks really yummy! I don’t want to sound ridiculous saying this, but it is perfect. I wouldn’t change a thing!!! Pingback: Mystery Blogger Award! – Abbey Co.
Pingback: The Best of Abbey Co. – My Hi-Lights of 2017! – Abbey Co. Previous PostPrevious ﻿From the Grocery Aisle to Garden – How to grow veggies from your kitchen scraps!